It is believed the amount stolen was about €10,000. 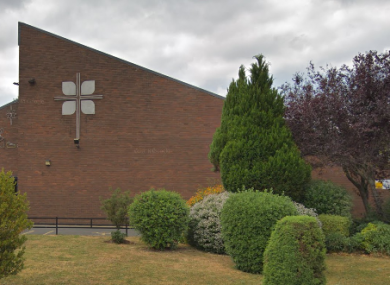 A SOUTH DUBLIN community is “appalled” and “in shock” after money was stolen from two church collectors at knife point in the grounds of a Tallaght church, with one of the men being slashed in the arm. Gardaí confirmed that they were investigating the theft of a sum of money and an assault Balrothery, Tallaght yesterday morning. They said a man in his 70s had money stolen from him and received a slash wound to his arm. The man was taken to hospital with minor injuries and no arrests have yet been made. Speaking to TheJournal.ie local councillor Mick Duff explained that two parish volunteers with were taking the weekend collection from St Aengus’ Church to the bank yesterday morning at about 10.30am. Duff said that usually this would be a “mundane amount of money” but this week a charity collection for St Vincent de Paul, the parish Christmas raffle money and the usual collection were all being transported. The two men – aged in their 50s and 70s – were approached by a man with a knife who told them he was taking the money. When the man in his 70s resisted, he was slashed with the knife before the robber escaped. “It was an appalling thing to do and it has shocked the entire community,” said Duff. The anger here is palpable… people are worried at the increase in anti-social behaviour. People have been dropping into the community centre since it happened to show their support. Duff said that there was a call to increase community CCTV cameras in the area in order to combat anti-social behaviour. He said despite the concerns, “the community response has been brilliant”. People are very good… We’ve a great parish here and I love to see this happening… It sends out a message that things are not as bad as they seem. He said fundraising efforts were underway to help the church make up the charity money that had been stolen. Email “Dublin community 'shocked' after money stolen from church collectors at knifepoint”. Feedback on “Dublin community 'shocked' after money stolen from church collectors at knifepoint”.